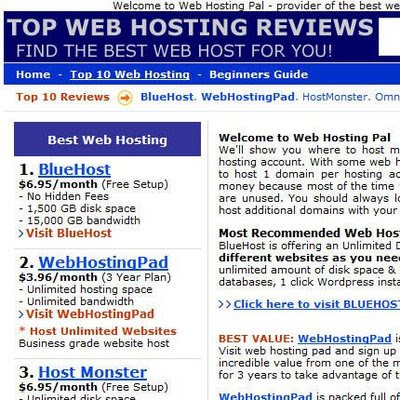 Searching for some web host reviews I ran into Web Hosting Pal. It is guide to finding web hosts that fits your budget which can even be less than $5 a month which offers PHP & MySQL, Unix, Windows and FrontPage. The website lists the top 10 web hosts in the homepage which is very helpful and appropriate listing of the price per month, web space and bandwidth provided. These are the three main things we look in a web host on the first go. You can also browser through the hosts listed for your e-commerce web application with CPanel and PayPal option if you want to sell products or services from your website. The data provided in Webhostingpal.com includes all the features the web host provides. The beginner’s guide page has described the currency, cost in cycles, plan features, e-mail features and others in the right way and explanation is also easy to understand. The top 10 page has the top 10 hosts listed. And the review of the hosts is either an internal link or links to an external review. The review of a host has sections like overview, features, customer support, highlight, disadvantage and our advice. In the left side the tabular presentation of needed services and their description make it easier to select the host. This gives a good idea on how the host will function and will it meet the client’s need or not. The reviews provided are realistic and reader friendly. I have used Bluehost and I know why it deserves the top spot. I’ve seen Bluehost at top at other review sites too. In the reviews the highlight segment and customer support are good to have a read. The website has a minimal design with use of colors only no images except logo. On the contrary it still is able to present the information needed in a readable fashion. But still the website can better in the design and can still provide more extensive reviews with user comments. All in all it is a good site to look at if you are looking for a web host. It may not have the widest range of hosts listed but it has not missed out the good ones. Before buying your web space have a look at Web Hosting Pal.